Stuffcool has launched 10000mAh Type-C 3A Fast Charge Power Bank (B1062) and Type-C to C cable in India. Stuffcool 1062 power bank has a dotted textured body, weighs 231 grams, has a compact body and features four LEDs that light up in white to indicate the current charge level and charging/ discharging of the power bank. The Power Bank offers two standard Type-A USB ports (5V/2.1A max), one Type-C port (5V/3A fast charging) that can be used for both input/output and one Micro-USB port (5V/2A), which can only be used for charging the power bank. 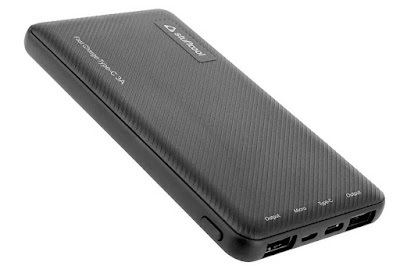 The company says that this is the only power bank available with real Type C 3A input/output, while other brands offer maximum 2.4A input/output. Stuffcool has also launched the minima Type-C to C cable (3A max) with 15cm of length to charge your smartphone with type C input using the Type-C output port in Stuffcool power bank.